Hello, I am Molly Hanson, BERNINA Ambassador and blogger at Sew Wrong . . . Sew Right, and now I can add author to the list too, as my very first book, Free Motion Quilting for Beginners (and those who think they can’t) with Martingale Publishing, is coming out in November. I am a certified free-motion quilting addict – and I sure got a lot of practice with all the projects and samples I made for the book. 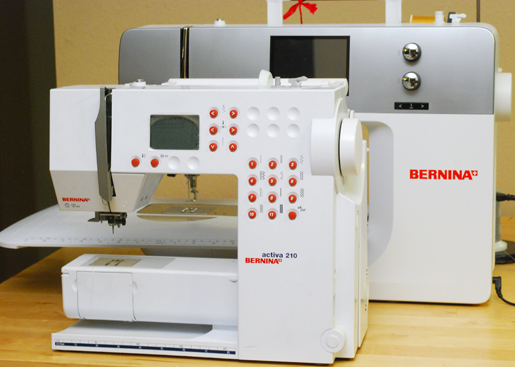 I had my trusty partner in crime right by my side though – my BERNINA 750 QE – to help me get the job done. I started learning free-motion quilting on my BERNINA activa 210 a few years ago, and now I’m working on a B 750. 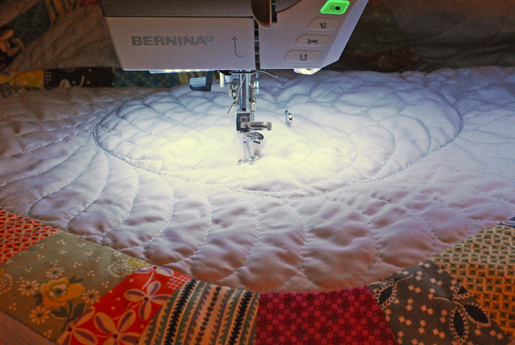 Along the way I’ve learned some things about how a BERNINA sewing machine quilts that I just LOVE. How much do I love my machine for free-motion quilting? Let me count the ways . . . here goes! #1 – The PERFECT presser foot for Free-Motion Quilting. 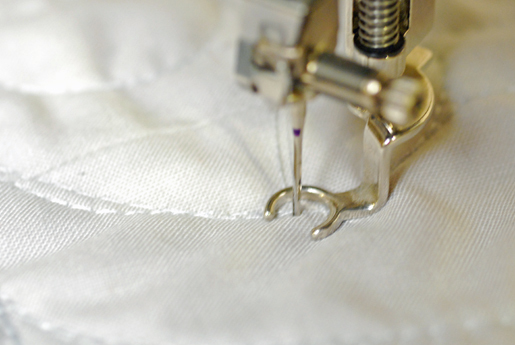 That is right, BERNINA has designed the perfect foot for the job – my personal favorite, Free-Motion Embroidery Foot #24. If you have ever quilted with another machine you probably noticed a difference, maybe a bit more drag or a less easy motion with your quilting. This is probably because the darning foot you were using wasn’t even close to as good as the one made by BERNINA. The spring-loaded design of BERNINA’s free-motion feet actually works with you to hop along the surface of your quilt instead of staying fixed, making the quilt easier to move and improving the stitch quality. #2 – No tension frustrations. I have to say that one of my very favorite things about quilting on my BERNINA sewing machines is that I rarely ever even think of having to touch the tension dial. The pre-set tension is perfect for most brands of thread I use and I just don’t need to fuss with it. I can’t say that for any other machine I have tried – and boy can tension problems be a headache! #3 – A front-loading metal bobbin case which can be disassembled for cleaning and oiling. 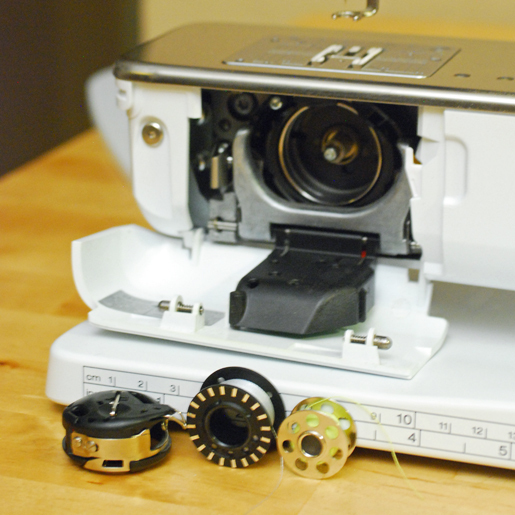 Maintaining your machine properly is so important for frustration-free free-motion quilting. Many modern machines have top-loading bobbins with built-in bobbin cases that can’t be disassembled for cleaning and oiling. They claim to not need oil or to be deep cleaned. A machine that can’t be properly cleaned and lubricated own’t hod up to the job very long. I am glad not to worry about those things. B 750 bobbin next to activa 210 bobbin. Guess which one holds more thread? The next items are specific to my new 750 QE. #4 – Good lighting! When you are quilting with matching/blending thread, good lighting is essential for excellent free-motion quilting. The B 750 QE has you covered on that! I love how the whole work surface is brightly illuminated with a white light that makes it easy to see the thread on the surface of the fabric. #5 – Huge throat space! One thing that really changed my quilting life was the size of the throat on the 750 QE. The activa 210 has a pretty tiny throat; workable, it not generous. The 10 inches of glorious space to move quilts around in on the B 750 QE has been so very nice! The full-size quilt I am currently working on feels like no trouble at all, when before it would have been a serious challenge. BERNINA activa 210 in front of BERNINA 750 QE. #6 – Sewing at high speeds!! The B 750 QE is really fast and chews through fabric at the alarming rate of 1000 stitches per minute. When you are working with a tight deadline, any time saving is precious, and being able to quilt faster really helped me complete my book on time! #7 – The BERNINA Stitch Regulator. I am brand new to the world of stitch regulators, and have gone so long without using one that I never saw a need for one . . . until recently. 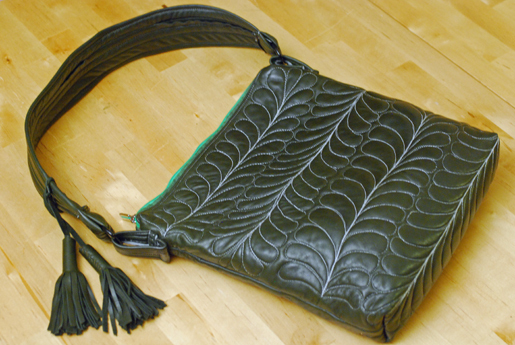 I had a beautiful piece of lambskin leather that I wanted to quilt first and then turn into a handbag. 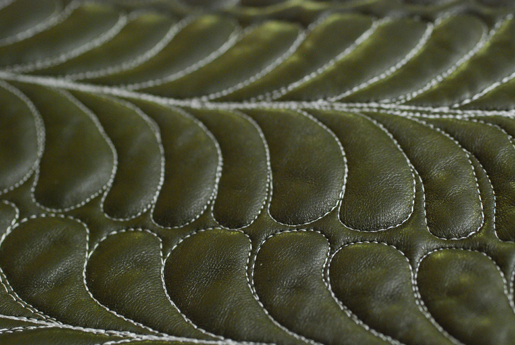 I wanted those stitches to be as perfectly spaced as possible, and there are no do-overs when you are working with leather. I pulled out that stitch regulator and got perfect results. I was grateful to have it, and glad that it was included with the B 750 QE, because I may not have purchased one for myself and then I would not have had what I needed for the job. 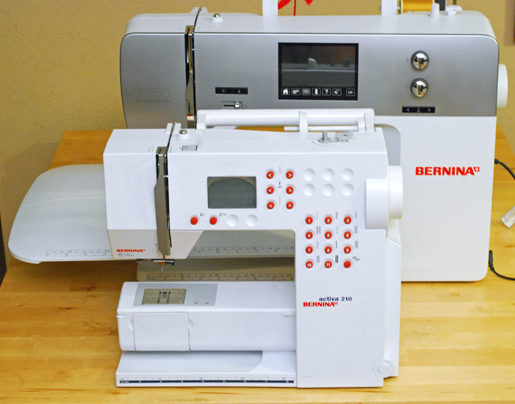 I could go on and on, but I am sure that there are many other things that YOU all love about free-motion quilting on your BERNINA sewing machines too. Be sure to share in the comments below! 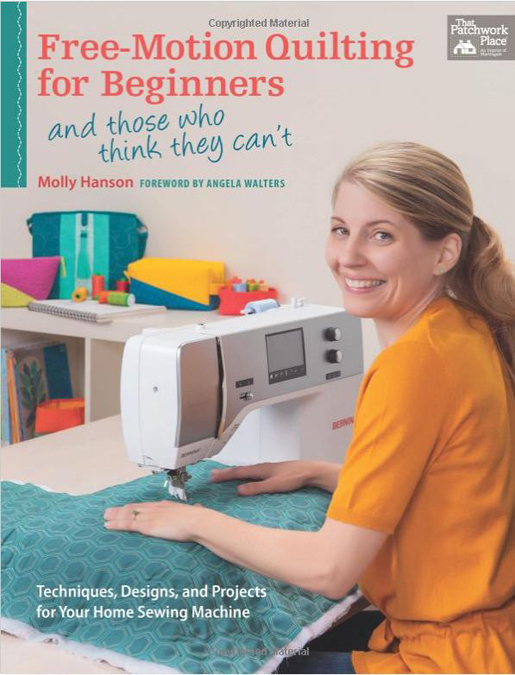 Watch for Molly’s book – Free-Motion Quilting for Beginners (and those who think they can’t) – due to be released November 4. That’s less than two weeks away!